Short on time? Few veterans? Regardless of the circumstances facing your marching band, these strategies can help you blaze a path toward success. The first day of rehearsal can be the most stressful day of the year for directors and instructors. New students have to get acquainted, paperwork needs to be completed, drill has to be handed out, music needs to be memorized, and so much more. The first day of rehearsal is also one of the most important days of the year, as it sets a standard for the rest of the season and lets the band members know what to expect. • How late into the summer is it? • How many returning (and new) members are there? • How soon is the first performance of the season? • What level of performance are your students at? How late into the summer is it? The later it is in the summer, the more pressure there is to get moving with the show. The first football game could be in three weeks! At this point, teach your students everything they need to know to execute drill, and start teaching drill as soon as possible. How many returning (and new) members are there? How long have the students had the music to work on (if at all)? If the students have had their music for a significant amount of time, or enough time to learn it and begin the memorization process, more time can be spent on basic technique, such as proper breathing, tuning, etc. If it is mid-August and the students are reading the music for the first time, you might need to jump right into the music and begin basic technique studies at a later time. How soon is the first performance of the season? That first football game always seems to be too early! But, realistically, you need to hit the half time field with something presentable. If the first performance is sooner than later, it might be necessary to concentrate on more show-oriented tasks such as learning drill and memorizing the show music. While most of us would rather have a really clean opener than a mildly dirty half of the show, we know the school administration will be knocking on your door if your halftime show is only three minutes long. What level of performance are your students at? Hopefully, this level grows each year. 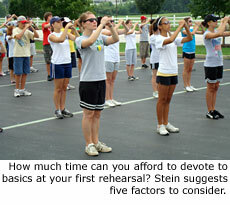 If you're in the situation where you are a new band director building a program, or it is the program's first few years in existence, more time should be spent on foundations of a good program, such as rehearsal etiquette, musical and visual technique, etc. If your students are at a higher level, they will be rehearsing well by themselves and executing proper technique already, and more time can be spent on show-oriented tasks. 1. It is the first week of July, the members have had the music for a month-and-a-half, and we have two months until the first football game. We have not received any drill yet. It is a three-hour rehearsal. I would begin the rehearsal with the usual stretch and brief run, and then hit the basics block for an hour or so. 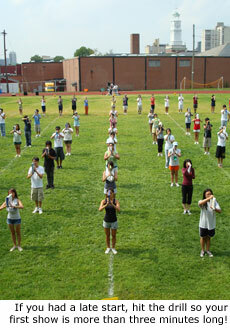 I would cover parade rest and attention positions, mark time, and give a brief introduction to forward marching. Then, I would break off into woodwind and brass sectionals and work on warm-up exercises and basic technique; brief show music at the end. 2. It is the third week of July, the members are just getting the music, and we have a month-and-a-half until the first football game. It is a three-hour rehearsal. We have drill for the opener. I would begin the rehearsal with the usual stretch and brief run, then a fast-paced basics block to explain standing positions and forward, backward marching. I would then go to music block, which would include a semi-brief warm-up, and jumping right into show music. We would start learning drill at the next rehearsal, after basics block. I would begin with the usual stretch and brief run, and a two-hour basics block to introduce standing positions and marching in all directions. Although this is much quicker than it should be, we must perform at the football game. I would then teach everyone how to read a drill chart, and begin drill rehearsal. After lunch, I would continue with drill, followed by two hours of music rehearsal at the end. For the rest of the week, I would continue with the same schedule. 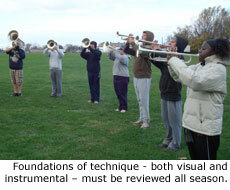 After we finish a part of the show drill-wise, I would put music to it, then move on to learn more drill. Obviously, the later in the season the first rehearsal is, the less time there is to spend on the necessary foundations of visual and musical technique. While in a perfect world summer rehearsals would begin the first week of July, and we would have numerous hours of basics and warm-up time to instill great technique in our students, reality does not always work with us. The school may not want to pay custodial staff to have the school open for your summer rehearsals; students go on vacation and miss all of the basics; the music arranger you thought you had bailed out and now you need a show fast! These are all possible scenarios for a late start to a season, and can ruin a program if not handled correctly. It is important to remember that no matter what the situation is, there must always be some time spent on foundational techniques, and to never allow a rehearsal to feel rushed or out of control. Even with a late start to the season, it is still possible to instill great foundations of technique in your students. It will take a little bit longer, but with careful planning and proper teaching techniques, it is certainly achievable. Text and images courtesy of Rob Stein.